This is part of the stone wall built by the Chinese. The picture on the right is of the old Baptist Church in the Rockville Cemetery. Did you ever wonder where Rockville got its name? It got its name from the many rock quarries that are found in the Rockville area. A quarry is where they cut out big slabs or chunks of rocks. Limestone is one of the rocks they quarried. When did people start moving to Rockville? In Rockville the first blacksmith shop was opened in 1850 by a man named J.M. Perry.A blacksmith is someone who makes or fixes iron things by heating them in a forge and then hitting them with a special hammer. A blacksmith would make horseshoes or metal spokes. John Perry was a blacksmith from Germany. He later invented a rather crude plow that tore the earth's crust. Farmers used this plow to plow their fields before planting rows of crops. A major landmark is the stone church and cemetery. This church was made out of the rock from Ramsey Quarry in Rockville Park. You can see the church and cemetery on the side of the road. 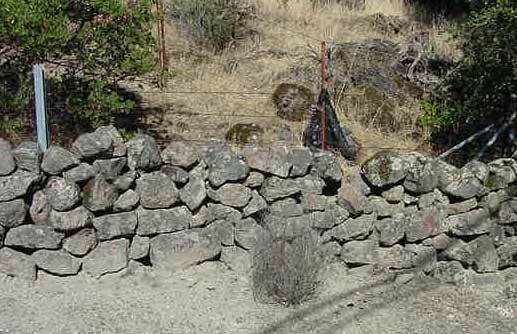 There are long stone walls along the roads in Rockville. They were built by Chinese workers. 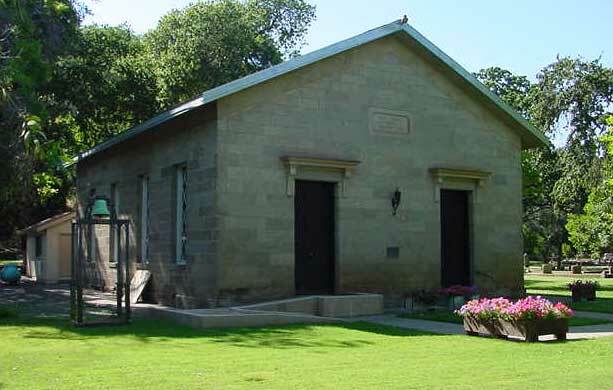 Wealthy settlers hired masons to build stone houses and churches. The two stone houses still around are the houses that belonged to Samuel Martin and Charles Ramsey. A mason is someone who knows how to build things out of stone and brick. In 1852 J.W. Seaver started the first general store in Suisun Valley. The same year Chrisley Manka opened up a tavern (a tavern is like a bar, sometimes it would have rooms to rent for the night) which is now Mankas Corners. By the middle of the 1850s there were several shops, a hotel, a stage depot (a place where the stage coach stopped to pick up people), and a school were in the area. Who lived here before the settlers? The Suisuni Indians had their head tribal village at Rockville. The Indians called this place "Yul Yul", meaning "the place of the setting sun". When the settlers brought smallpox in 1839, most of the Suisunis died or left the area.